Smart Launched 3 Strategic 700 MHz Cell Sites, Plans To Build 200 More Before The Year Ends! 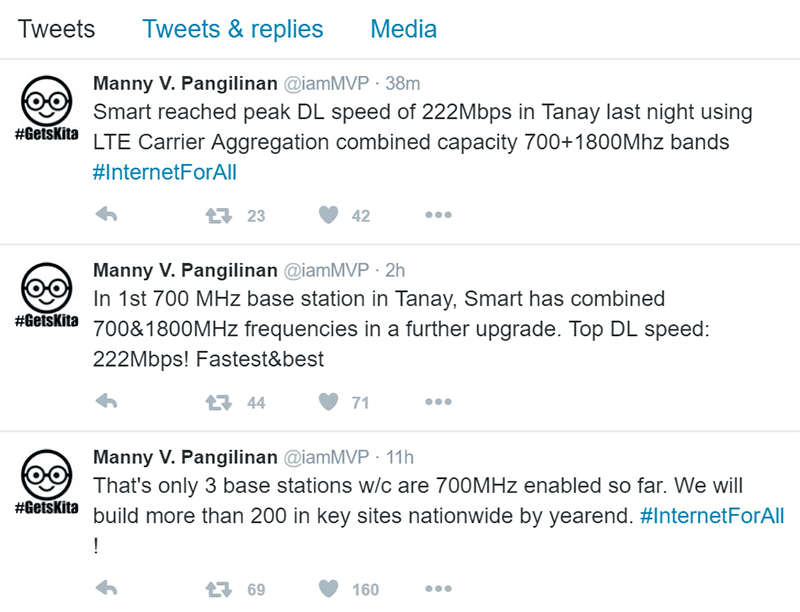 Home / news / services / smart / Smart Launched 3 Strategic 700 MHz Cell Sites, Plans To Build 200 More Before The Year Ends! Great news! Smart Communications Inc. just launched 3 new 700 MHz cell sites in Tanay Rizal, Ecoland Matina Davao City and Manggahan Pasig. Plus the company, thru MVP stated that they'll build 200 more sites to services their customers better before the year ends. To refresh our minds, both Smart and Globe bought the much debated, awaited and unallocated 700 MHz from San Miguel. That acquisition made Filipinos excited as our major telcos can now capitalize on that unused band to make their internet service have more coverage, nicer allocation, better speed, more stability and have cheaper price in the end. Note: Also remember that the top speed that Smart got will be distributed to a number of people. In case you're wondering why Smart didn't load those new sites in major areas in the Metro yet, Mr. Wo Rosete of Smart explained to us that there is a strategic plan behind it. Those rural areas are hard to reach by other frequencies except for the low 700 MHz frequency. That's why they needed those signals more anyone else. However, please bear in mind that building those cell-sites isn't an easy task which requires a lot of time, money and effort. In addition to that, most of our locally made smartphones and even other high-end smartphones doesn't support the 700 MHz frequency yet. So we have to be patient and positive as this process that won't happen in an instant. At least they are starting it and they have the will to make it happen. Now, let's hope that this type of resiliency by MVP and their competitor will continue to serve us better soon.